The Sixers' Nana loved Scottish shortbread. 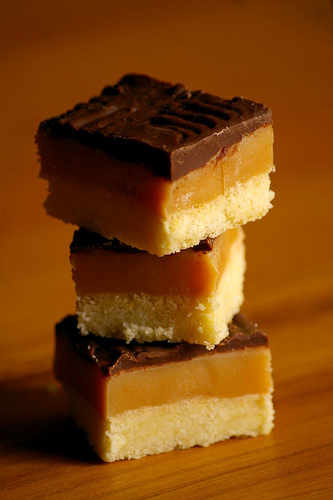 While searching for a recipe for the basic shortbread cookie, I came across these bars... they seem too good to be true! Preheat oven to 350*F. In a medium bowl, mix together 2/3 cup butter, white sugar, and flour until evenly crumbly. Press into a 9 inch square baking pan, that has been lined with wax or parchment paper. Bake for 20 minutes. You can use a double boiler or place chocolate & 1 Tb butter in a microwave-safe bowl. Heat for 1 minute, then stir and continue to heat and stir at 10 second intervals until chocolate is melted and smooth. Pour chocolate over the caramel layer and spread evenly to cover completely. Chill. Cut into 1 inch squares with a hot Chef knife that is dry.